Universities, research institutions, scientific organizations and regional authorities in the Science Region of Bonn have now all joined the current debate on xenophobia in Germany with a common appeal. 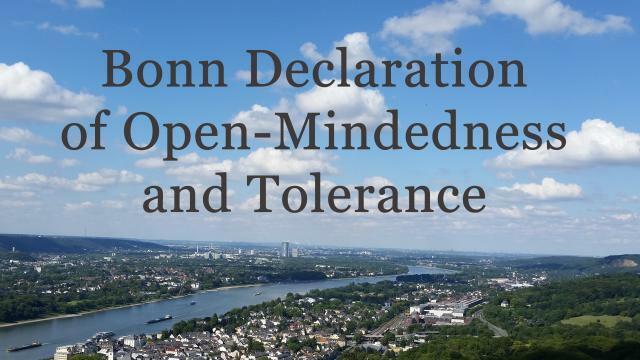 The presidents, deans, directors, mayor and district administrator are jointly taking a stance with the “Bonn Declaration of Open-Mindedness and Tolerance.” They are calling for solidarity from all the members of their institutions and all of the region’s residents. Science is fundamentally border-crossing and international. It relies on exchanging ideas and on encounters between people across all national and cultural boundaries. The Science Region and UN city of Bonn is a place where Germany and its international partners meet at every level. The world comes together in Bonn to discuss global challenges. The Rhineland is a core European region that has always supported a lively exchange between peoples and cultures. In an atmosphere of peaceful coexistence, strangers quickly become friends – a philosophy that continues to shape our region. The Science Region of Bonn stands for freedom, mutual respect and a culture of hospitality, both in our own country and internationally. Today we stand up to those who question these core values of our free social order. We invite all the members of our institutions and all of Bonn’s residents to join us.